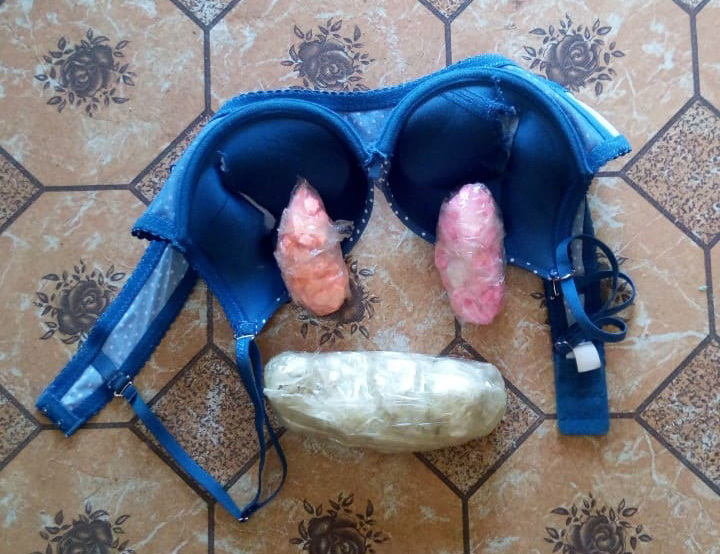 The illegal drugs that were found concealed in the woman’s bra. A Surinamese national was yesterday morning nabbed at the No.78 Foreshore, Corentyne, Berbice, after a search unearthed a quantity of cocaine and ecstasy among her possessions. Sunday Stabroek was reliably informed that the 27-year-old woman, who is said to be a hairdresser of Charlesburg, Paramaribo, Suriname, was arrested around 8.30 am after arriving via the backtrack route. Following her arrival, a routine search was conducted by officers manning the port on the woman’s possessions. It was during the search that 247 grammes of cocaine, 100 grammes of ecstasy and 192 ecstasy pills were found. The woman was immediately taken into custody and is being processed for court.